Drawing of the new heater block type. Drawing of E3D-v6 assembled using the new block type. Before the move to cartridge based thermistors E3D-v6 Hotends made use of a screw and clamping washer to grip the thermistor in place. This works well once assembled, but can be fiddly to assemble and maintain. 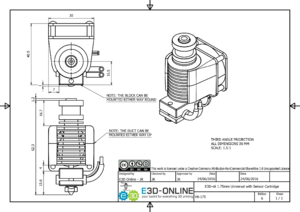 From mid-June 2016 E3D Hotends will transition to using a standard cartridge-type format for temperature sensors. 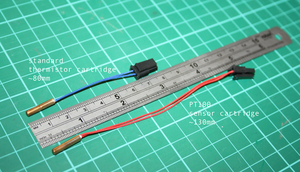 These will be available as Thermistor, PT100 or Thermocouple sensors. Cartridge-sensors are to be used with an updated design of heater-block, into which the sensor cartridge is secured using a grub screw. The new cartridge-sensor heater-blocks are marginally larger than the previous clamping washer heater-blocks. Cartridge-sensors are much faster to assemble, easier to maintain, and quicker to change to different sensor types. The new sensor format is also more robust and tolerant to abuse. All E3D-v6 hotends will be supplied with the new style thermistor-cartridge, and the new heater-block into which these fit. PT100 and Thermocouple cartridges are also available as optional upgrades. The 3mm diameter x 10mm length cartridge is fitted with a Molex Microfit 3.0 latched connector. There is an accompanying 1000mm cable with matching Molex connector supplied with each hotend. 1 What are all these sensor types? Which one should I get?! 2 How to differentiate between Thermistor cartridges and PT100 cartridges? What are all these sensor types? Which one should I get?! 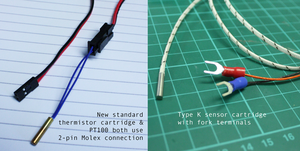 The three available cartridge sensors, Thermistor, PT100 and Thermocouple. If in doubt opt for the thermistor sensor type. These are supported by almost every 3D printer electronics and firmware and are easy to use. Our thermistor cartridges are based around the Semitec 104GT2 thermistor which is capable of sensing up to 300C - plenty hot for almost every printing material on the market. Thermistors can be directly connected to most electronics to the thermistor input. Our hotends are supplied with a cable that connects to the thermistor-cartridge’s Molex connector. Thermistors do not have a polarity so it doesn’t matter which way around you connect the wires to your electronics. 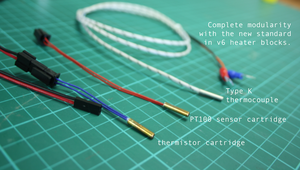 If you have a desire for high performance temperature sensing you may wish to use the PT100 Sensor cartridge. PT100 sensors are more accurate than thermistors and capable of sensing much higher temperatures - higher than the melting point of the aluminium block provided as standard. Higher temperature heater blocks are available on request. PT100 sensors are not supported by most electronics by default and require a separate PT100 Amplifier Board to convert the signal from the PT100 sensor into an electrical signal your controller board can understand. 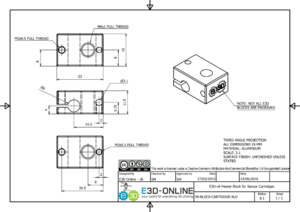 Please refer to the E3D PT100 Amplifier Documentation. Thermocouples are for specific applications, electronics or setups that need a thermocouple. In general if you are looking for a higher performance sensor the PT100 is a better option. Thermocouple Cartridges are capable of reaching very high temperatures, more than hot enough to process any plastic. Duet series electronics does not support analog thermocouple amplifiers, but supports digital thermocouple interface boards instead. See []. How to differentiate between Thermistor cartridges and PT100 cartridges? PT100 sensors have double the length of flying lead compared to thermistors. The two sensors are extremely visually similar, however the PT100 sensor has longer lead wires between the cartridge and the connector. In future batches PT100 sensor cartridges will be manufactured using red insulation on the lead wires, with thermistors continuing to be made with blue insulation. Thermocouples are easily identified by their white with black stripe glass fibre braided lead wire and do not have a molex connector, but are instead supplied with a 1m long continuous lead, and fork terminals. This page was last modified on 3 May 2017, at 09:33.